Translation, interpreting and proofreading in major languages, in the legal and financial fields. Translation service for the medical industry. Providing foreign language translation, editing, review, and layout. All translations of medical documents are edited by medical professionals. Translation in Spanish and English translations. Based in Vancouver, Canada. Specializing in Russian, English, German and Ukrainian translations. Express and regular translations. Translations in Russian and English in all areas. Providing telephone interpretation and personal correspondence translation. Translation centre offering fully co-ordinated on-line service. Regular and certified translations within dozens of languages. Translation for over 140 languages, website translation, localization and eBusiness solutions. Translation and interpreting between English and French. Includes a translation blog. English-Spanish translation and interpretation services by a former professor of translation. Translation and interpretation in over 100 languages. Formerly Asian Translations Inc. Rates in PDF format. Grapevine Translations offers accurate, prompt, and culturally sensitive Korean-English translation services. Translation and web site translation in English>,Russian. Company based in an unknown location. English/Spanish translation service. Specializing in document, web site, and multimedia translations. Expert technical translations, as well as translations in other fields, between the Russian and English languages. A translation company based in the UK which offers high quality English/Spanish translation services. Translation, terminology and web site translation, in English, German, French, Spanish, Italian and others. Services, rates and portfolio. Translation, web site translation and interpretation, in Spanish, English, French, German, Japanese and other languages. Also supplies interpreting equipment. Translation services, experienced in various subjects and text types, from technical translation to letters to literature, in German, English and French. Online translation management tool, for keeping track of ones translations. Includes ability to manage large translation projects. Trial registration. Lido-Lang Technical Translations offers the translation of all types of texts into European languages, including technical and specialist translations. Company specialises, in particular, in translations into Central and East European languages. Polish translations by native Polish speaker based in Poland. Includes published examples of translations into English and Polish. Verovar is a full service translation company located in Montreal, specializing exclusively in translations from English & French to Spanish. A full translation service covering a wide range of technical, scientific and business activities, with special expertise in the engineering field. Athens based translation office offering English-Greek-English translation and interpreting services. All types of translation work carried out from/to Russian and English including general, technical and web page translations. Chinese translation company focusing on English-Chinese translation, interpretation, website localization, and DTP services. Based in Beijing, China. English-Chinese translation services including document and website translation. Family-run translation service from English into Polish provided by M.A. in Polish Literature and Communication. Includes translation samples and credentials. Translation and localization company focusing on software and website localization, technical document translation and DTP. Based in Nanjing, Jiangsu Province. German translation service providing technical, medical, legal, and general business translations German<>English. Certified translation in over 56 languages. Includes certification for INS purposes, legal certified translations for school or law firms. If the business hours of Aplomb Translations in may vary on holidays like Valentine’s Day, Washington’s Birthday, St. Patrick’s Day, Easter, Easter eve and Mother’s day. We display standard opening hours and price ranges in our profile site. We recommend to check out aplombonline.com for further information. 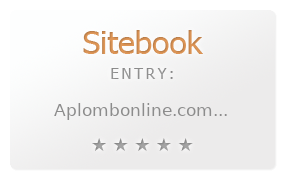 You can also search for Alternatives for aplombonline.com on our Review Site Sitebook.org All trademarks are the property of their respective owners. If we should delete this entry, please send us a short E-Mail.